I didn't find any info it's a classic well put together mission! 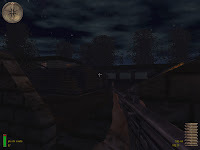 There is a single objective to retrieve documents, to succeed in it, you will need to fight and travel a lot in a coutnry yard full of well designed locations from some house to bunker with at the end a destroyed village. 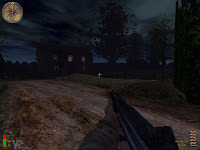 Design is directly quite impressive except the way you progression is oriented (bushes walls) the design is quite imaginative on a starting summer night on a not simply flat terrain you will need to progress with sometime help of your squad...enemies awaits you everywhere from a bunker to a house and even more. It's visually good and enjoyable to provide what we all are looking for :' and after the next corner what will I face' except some sky texture problem, that seems to disepear sometime, I didn't encounter any problem or missmatch.